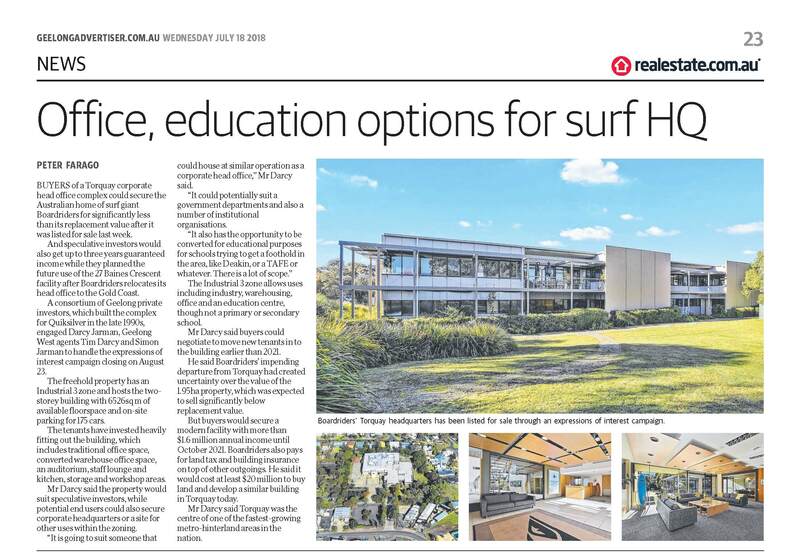 BUYERS of a Torquay corporate head office complex could secure the Australian home of surf giant Boardriders for significantly less than its replacement value after it was listed for sale last week. 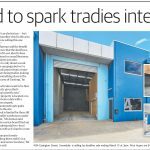 And speculative investors would also get up to three years guaranteed income while they planned the future use of the 27 Baines Crescent facility after Boardriders relocates its head office to the Gold Coast. 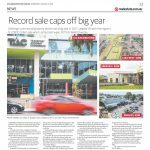 A consortium of Geelong private investors, which built the complex for Quiksilver in the late 1990s, engaged Darcy Jarman, Geelong West agents Tim Darcy and Simon Jarman to handle the expressions of interest campaign closing on August 23. The freehold property has an Industrial 3 zone and hosts the two-storey building with 6526sq m of available floorspace and on-site parking for 175 cars. The tenants have invested heavily fitting out the building, which includes traditional office space, converted warehouse office space, an auditorium, staff lounge and kitchen, storage and workshop areas. 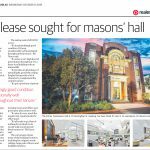 Mr Darcy said the property would suit speculative investors, while potential end users could also secure corporate headquarters or a site for other users within the zoning. “It is going to suit someone that could house a similar operation as a corporate head office,” Mr Darcy said. “It could potentially suit a government department and also a number of institutional organisations. The Industrial 3 zone allows uses including industry, warehousing, office and an education centre, though not a primary or secondary school. 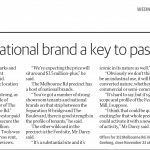 Mr Darcy said buyers could negotiate to move new tenants in to the building earlier than 2021. He said Boardriders’ impending departure from Torquay had created uncertainty over the value of the 1.95ha property, which was expected to sell significantly below replacement value. But buyers would secure a modern facility with more than $1.6 million annual income until October 2021. Boardriders also pays for land tax and building insurance on top of other outgoings. He said it would cost at least $20 million to buy land and develop a similar building in Torquay today. Mr Darcy said Torquay was the centre of one of the fastest-growing metro-hinterland areas in the nation.